The highest Leadership in Energy and Environmental Design certification. Duke’s Ocean Conservation Center in Beaufort, NC. 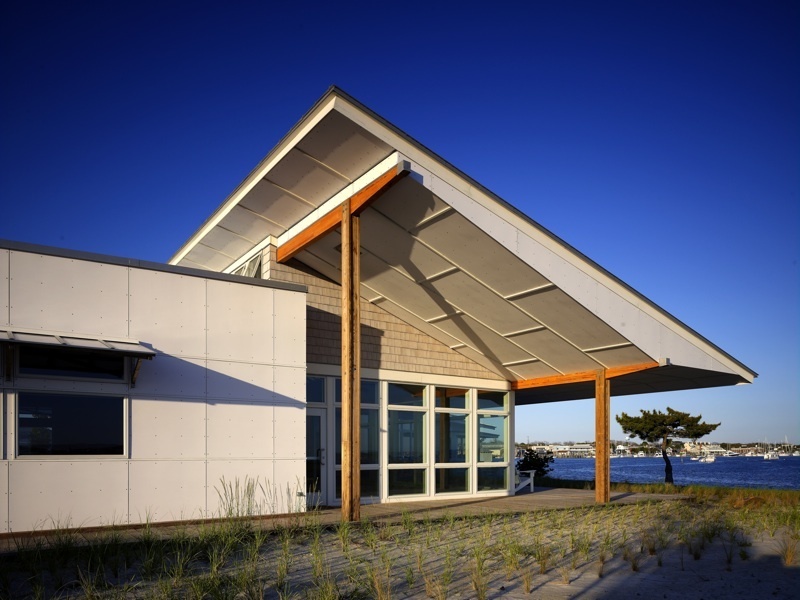 Raleigh architect Frank Harmon, FAIA, principal of Frank Harmon Architect PA, recently learned that the Ocean Conservation Center (OCC) his firm designed in Beaufort, NC, for Duke University’s Nicholas School of the Environment Marine Laboratory has achieved LEED Platinum certification. Platinum is the highest Leadership in Energy and Environmental Design (LEED) certification that the U.S. Green Building Council (USGBC) awards. Located on Piver’s Island at the head of the Beaufort Inlet, the OCC provides state-of-the-art teaching facilities for the Duke Marine Lab while identifying and demonstrating innovative, environmentally sound design and construction technology. The OCC’s glass-enclosed common area. The 5000-square-foot building’s angular design responds directly to the site along the edge of the island. The shape defers to prevailing southwest breezes blowing in from the channel and allows natural illumination to serve as primary task lighting in every interior space. It also creates a very natural open, inner courtyard for the campus. 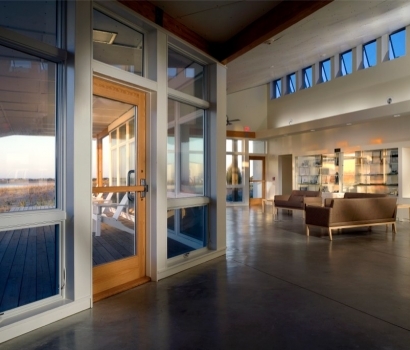 The channel side of the building features a large, wooden porch just outside of a glass-enclosed common area, which provides panoramic views of the natural surroundings. The wood-shingled exterior complements the coastal context and the roof’s deep overhang protects the interior from the hot summer sun. The building is designed and engineered to resist hurricane-force winds in excess of 125 mph — a very real threat in Beaufort, NC. Building materials include wood, wood shingles, glass, and cement panels. The fully designed wood frame is comprised of Atlantic white cedar, recycled wood, and Southern yellow pine. State-of-the-art green features include photovoltaic rooftop panels for converting sunlight into electricity, a solar hot water system, a vegetated roof and rain water collection cistern, and high-efficiency ground-coupled heat pumps. Recycled and local materials were used wherever possible. Landscaping includes a large, new dune that directs the wind over the building, rather than directly at it, and protects other all-native landscaping features. Earning LEED Platinum certification is a comprehensive process. A project must meet all requirements during a rigorous evaluation of building system efficiency, sustainability, water efficiency, materials used for construction, and environmental quality. Architect and client must be fully committed to sustainability and the process. LEED certification is recognized across the globe as the premier mark of achievement in green building. For more information: www.usgbc.org/leed. For more information on the OCC and Frank Harmon Architect PA, visit www.frankharmon.com. Frank Harmon, FAIA, is principal of the multi-award-winning firm Frank Harmon Architect PA in Raleigh, NC, a Professor in Practice at NC State University’s College of Design, and the 2013 winner of AIA North Carolina’s F. Carter Williams Gold Medal, the highest honor presented by the Chapter to an AIA NC member to recognize a distinguished career and extraordinary accomplishments as an architect. In 2010 Harmon was included in Residential Architect’s inaugural “RA 50: The Short List of Architects We Love.” In 2013, his firm was ranked 21st among the top 50 firms in the nation by Architect Magazine. Frank Harmon is also the author and illustrator for NativePlaces.org, a series in which he uses hand-drawn sketches and mini-essays to examine the relationship between nature and built structures. For more information: www.frankharmon.com. Contact information: frank@frankharmon.com; 919.829.9464; 14 East Peace Street, Raleigh, NC 27604.